I dagens anledning af Blog Action Dag 2011, bliver indlægget resten af indlægget på engelsk. #BAD11 er nemlig en international begivenhed med bloggere fra ikke mindre end 97 lande. 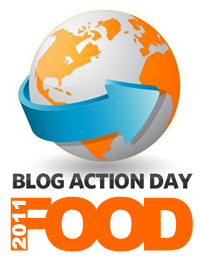 This years topic for Blog Action Day is food. For me as a foodblogger this is a great opportunity to write something a little different about food than I usually do. There are many things I could write about and it has been a little difficult to pick a subject. Should I write about the things closest to my heart? Then I would write about organic food, quality produce, animal welfare and my new found passion: reducing unnecessary waste of edible scraps and leftovers. But wait - that's what I already write about on a regular basis. It is said that variety is the spice of life - and I couldn't agree more. So my topic of choice is just that: variety. I eat a lot of different food items - and I try to get as much variety in my diet as possible. I'm a fan of different flavors and textures - and I love to explore them. Friday night I had a rare opportunity to taste genuine caviar from The White Sturgeon. I had caviar before - but NEVER like this. I was completely blown away by both the flavor and the texture. 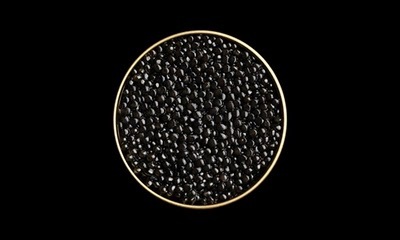 I would never have imagined that caviar could have such fatty richness and depth in flavor - and at the same time it felt almost sparkling on the tip of the tongue. I will never forget the saltiness and the richness. The caviar was accompanied by an avocado mousse, paper thin toast and a glass of champagne 1. Cru "Carte Blanche" Bernard-Pitos. On Saturday I made a very humble lunch in contrast to the fancy dinner from the night before: a grilled cheese sandwich. Simple ingredients, no surprises there. And then again - the cheese was an hay-smoked organic Gou®Dan. Bread, cheese, tomatoes and French's sennep. Golden brown and delicious. Crispy on the outside and filled with melted yummy goodness. Oh, and it was oozing lovely smoked cheese. So, do I prefer caviar or grilled cheese? Honestly - I like them both equally much. Posh or plain, it's all about variety. Eat everything the world have to offer.